Not them and not the mall, but close enough. I am newly married and I find that being divorced it seems to make me a little jaded to the whole romantic wedded bliss environment that is pushed on us by the movie industry and others. On the other hand, being divorced I learned a thing or two about what causes problems in a marriage both through my own experience and through helping with a divorce ministry and through my faith. I’d like to think this ultimately makes me a better husband, though as I admitted above I have a little tarnish to my sparkly view. I recently popped over to the mall during lunch. It was a nice spring day and I was very surprised that just getting out into the sunshine on one of our first really nice days this year after a long, long grey winter was amazingly invigorating, inspiring even. I was full of energy, had a dozen ideas fly through my head about all kinds of things and was really pumped up about my life. After all I’ve been blessed by God with a wonderful wife, a great job, terrific kids, a beautiful place to live, material resources that comfortably meet our needs and provide a little extra for fun once in a while; in short I’ve got nothing to complain about. As I was walking through the mall in this euphoric state, I came upon them; I’ll call them The Mall Walkers. The mall was fairly deserted at that point of the midday Monday when I chose to visit and so it was certainly easy to see anyone who was there. 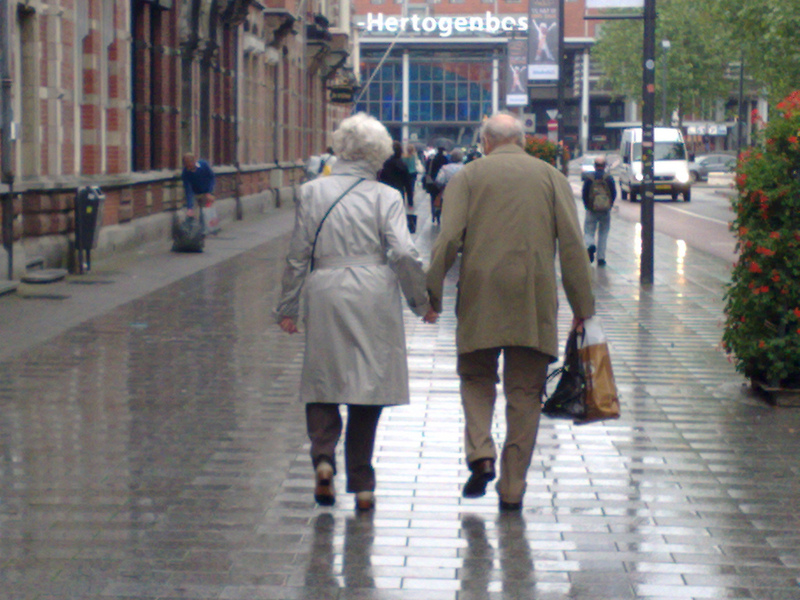 I saw them approaching, an elderly couple, leisurely walking. Now when I said mall walkers, you were probably thinking that these were those power walking folks with weights in their hands, but this couple in no way represented that frenzied, hectic lot. No, they were just the opposite, the other bookend to that alternative mall walker. They were as carefree as could be, I would guess both retired, simply enjoying the here and now and strolling through the mall before it will most likely tonight transform into the teenager, child-in-stroller, parent at wit’s end place that many of understand a mall to be. Just as I know all the things I mentioned above as examples of my life were provided by God, I know this couple being there at that time was the provided by Him for my education just as well. The moment I saw them, I went from the life I have now to what I hope God allows my life to end like. I want to be The Mall Walkers. I know nothing about them except what I witnessed in those brief moments and then what my mind has added, but again I feel it was an inspiration to make me be the best I can be. The Mall Walkers were holding hands, smiling and just casually speaking to each other. About what, I have no idea, as I certainly did not overhear anything, but it was certainly entertaining them both as they walked and smiled. Were they reminiscing about a past experience, talking about their grandchildren or simply discussing what they had just eaten at the food court which they may have just left? I’ll never know but in that moment their sheer bliss of life transported me from my happy state to an even happier one where I envisioned my wife and I doing just that many years down the road and being just as happy. The Mall Walkers were obviously in love and totally content with just each other’s company on this sunny Monday afternoon at the mall. My wife and I sometimes talk about how we are “old” yet newly married and how we missed the chance to have met decades ago and been one of those couples who get to their 60th or 70th wedding anniversary. My wife always chides me for harping on the negative of that and points me to the correct focus; we can still have decades together and grow old together, even though we might not get to those astronomical numbers. She’s right and in The Mall Walkers, I was given that glimpse. After all, what if one of the things I did not know about them was that they were both divorced and had had similar conversations decades ago when God brought them together, and look at them now?! God’s plan for our lives is what it is, just as it is for The Mall Walkers. The gift God provided that afternoon was to instantly through The Mall Walkers take me what I hope will be at least 40 years in the future and to just imagine. What will all our kids have grown up and done? How many grandchildren and perhaps great-grandchildren will we have? How will the challenges we face today be looked at by our 40-year-plus-in- the-future selves? Will they be something we laugh at, as perhaps The Mall Walkers were doing with one of their old challenges, or will they have consumed us in some way, removing a piece of our essence, our identity? I felt an immense understanding in that moment that worrying about the moment is such a waste. God teaches us that everything works for His glory and so if we follow His ways we will get to experience some wonderful things on the way. Where will we have traveled? How many people’s lives will have been made better because of our influence in them? How many new souls will God have in His Kingdom because they ran across us just walking in the mall thanking God for the wonderful life He allowed us to live? Is that what was meant to happen today? I know God only knows but I am thankful for the experience and for the moment in time I came across The Mall Walkers. I pray God blesses them with many more years and strolls together so they can continue to provide that impact to others and I can only hope we do the same in some small way. All the petty things my wife and I argue about, all the dumb things we get upset about our kids about fall away when you change your perspective. God teaches us to look at the eternal impact of things. How we model life for our kids will impact how they model it for theirs and so on down the generations. The Mall Walkers are not bitter and petty people, just happy and comfortable in their place in the world. I believe they are God fearing souls who are an happy as they are because they are at peace that they have eternal life and a loving Father awaiting them and that in the meanwhile they are doing the right things here to those ends. That’s all I can pray for with my wife and I. She is wonderful and she makes me more wonderful because I am with her and we support each other. Our trials are not her trials or my trials, but our trials. I know The Mall Walkers spent their time the same way, lifting each other and other’s up just by their presence. I love my wife so much I can’t wait for what we can do together to make the world a better place. All we may ever do is point our kids in the right direction and watch them grow, but if that’s God’s plan then that’s OK. If he has a bigger plan, I’m sure he will show us the way and give us what we need to accomplish that. Life is good. And God is great. For whatever reason we seem to feel that unless something noteworthy is happening then something is wrong. As a culture this has been ingrained in us with the flood of news and other programming that just focuses on the sensational. We do not hear anything about the President eating his dinner while helping his kids with his homework, or how Alex Rodriguez had his car towed one day because he got a squirrel stuck in his fan belt. One could argue that this “public figures” are expected to do great things and so when all we hear about is how President Obama was involved in gun legislation or Alex might be using banned substances, I guess I can buy the argument that we expect more of them. So let’s take it so the level I’m talking about. How often do you go to lunch with a colleague and just have them take you through what they made for dinner the last week, or meet up with a friend at a school function and talk about how many loads of laundry were done or if all the kids brushed their teeth or if he mowed his lawn yesterday? If you are like most, the answer is never, unless of course those events played into some funny story about how while mowing his lawn yesterday he happened to run over the water valve and snap his blade and now he needs to get an expensive repair done. Yet without this “blocking and tackling” in our lives, the big things can’t happen. It is in the quiet slog of the ordinary that preparations for the extraordinary take place. Our pastor talked about this week how as a Christian when we go to work we should WORK. Not chat around the water cooler for an hour, not gossip about co-workers or do other things. We should be a model of responsible work. Once we prepare the table, set the example by quiet consistency not glory hounding, we can experience the feast or the victory of a job well done. Without those ordinary processes the groundwork is not there for anything special to happen. Too many parents, especially single parents, feel that just doing the daily tasks does not make them a success. They don’t hold the exciting job that their child wants them to come in and talk to their class about, or have all kinds of extra money laying around to buy something that their friends will be talking about for years. As you look back on your life what do you recall about the people in it that meant the most to you? Were you friends with an Olympian, or did you play pick up football games with your friends, college roomies or work colleagues? Did you get personal stories written for you by a Pulitzer Prize winner, or were the best things you ever read written by your children, your spouse or a long lost friend who reached out to reconnect on Facebook or some other medium after years of absence? Did you race in the BMX Supercross Series on expensive equipment or were your off-road experiences on the back of a beat up ATV or a small mini-bike built by your uncle with spare parts from other engines? Most people live very fulfilled lives and never touch greatness as all, so why are so many of us obsessed by using it to measure our lives? It is winter right now and in many parts of the country that means months of grey, bleak days that can cause us to focus more on the fact that each day we just do the dishes, go to work, wash the clothes, feed our families and go to bed. These things are only dull because we feel they are. Without them our families would not function and with that our lives would diminish and fade. So take heart if all you feel you are doing is ordinary. The greatest things we can provide for our families is the stable ordinary everyday life rather than chaos and drama that causes fear and uncertainty. So last night I’m getting ready to take the kids off to the ex’s as I prepare to head out of town to my best friend’s daughter’s bat mitzvah. As I’m backing out of the driveway I’m going through the mental checklist. Lawn mowed. Check. Kid’s off to ex and explained that they will not see me tomorrow after they get off the bus but before mom picks them up. Check. EZPass in the car. Check. Dog… oh crap, THE DOG!!! In a panic, I realize that I had completely forgotten about what to do with the dog while I am out of town. Now to make myself not appear like a total doofus here, I do have a few things on my mind. I’m getting married in about three weeks and I’ve been working on getting a couple bunk beds ordered from different stores this week as well as doing my job, preparing for the honeymoon by calling some vendors out where we are going and a myriad of other things. Look. I’m really sorry I forgot about the dog. I’m only human. Normally my ex takes him as she feels a sense of obligation to step in since we have the dog mainly because of her. This weekend however, the kids have told me they are going to be at a hotel because she is redoing her kitchen. She doesn’t have money to pay for her taxes, but she’s redoing her kitchen? Stop. Focus man, focus. You need to figure out what to do with the dog. I call her, and sure enough after I explain how I was not even sure I told her I would be out of town this weekend, she tells me that they will not be home so she can’t watch the dog. That option has now vaporized for certain, if there was any possibility of it being real anyway. My fiancée calls her normal person who watches her pets and children. She works night shift so we may not hear from her for a while. I contact the vet. No we do not board. Here is the number of a pet sitter we know maybe she can help. Call her. Leave message. Started looking up boarding places that might not require an extensive pre-evaluation that I now do not have time for. Thank goodness the dog is current on shots and other things. Left some messages. Pet sitter calls back. She is booked. Another option into the vapor. Called my friend and talked to him about the possibility of the dog thwarting all our plans. He suggests the vet. Already done. He suggests kennels. I explain the evaluation process. He goes on about how they normally just segregate them for an hour. I explain I have done that before but, I guess in an attempt to appear more upscale, everywhere in my state requires background checks, gun permits, and DNA analysis before they will take your dog. Sometimes they even need to take a paternity test to make sure that your dog has not fathered some cross breed with a cat or something. If dog kennels ran Homeland Security we’d have no terrorist problems, I promise. I talked to my parents. I know they were trying to be helpful. They suggested dropping him at my soon-to-be-in-laws. I informed them they were two hours away. I also mentioned that they do not have a dog. They have a cat. Who has not met my dog. In fact my dog has not met any cats. Probably a bad idea to have the first meeting of a new species be in a rush when heading out of town. It works for drunk businessmen in Vegas, but probably not a good call for this situation. There are other things I did not mention to my parents, such as not imposing on people who have plenty of other items going on, like their business and such. We talked about the same things I talked to my friend about. My parents do not have pets mind you, so the questions are a little weird. Don’t they have places you can take dogs, like hotels? Yes, kennels. Called a few, all closed, have to wait until morning. What about the doctor thing? The vet? Yes tried them. Can you ask a neighbor? Sadly, I am about as close to my neighbors as the rest of us. I stand next to them with my child at the bus stop and say good morning. I do know their names which puts me ahead of 90% of the population, but I’m still not comfortable enough with them to go knock on their door at 9 PM and ask them to watch my dog for the weekend. My mom tells me that this is why she does not have pets. I explain that is good, but not helpful right now. At this point, I’m seriously contemplating taking the dog with us and sleeping with him in the car in the hotel parking lot. That way I can avoid him taking a dump in the car. And the probable citation or arrest for animal cruelty. Not very helpful to drive across states to attend an event and find myself in jail for something. If I was a Kardashian maybe that would work as a new publicity stunt, but I actually have to hold down a real job. My friend thinks I’m nuts. At this point I agree. In the morning, I still have the same set of options. No pet sitter. No kennel. No possibility of my homeless dog in a car. I start calling kennels as they open and pleading my case, explaining that my normal option fell through and now I am having to find a place on short notice. If you recall from earlier posts, I strive not to lie. Ever. It was tough finding a way to spin this one as I’m walking that borderline of lying by omission here. With my friends I was brutally honest. Yes, I’m a moron who has been planning to go out of town for over a month and just happened to overlook the dog situation. With a business that I’m trying to take a dog they don’t know from a person they don’t know, I feel showing myself as a disorganized idiot who also shows now as a borderline degenerate pet owner does not play into my favor to find our puppy a temporary home for three nights. So I tow the line of my ethics and working in doggie-kennel/border patrol/Homeland Security/cavity-searches-for-mouthing-off land and leave off the details. I get one to possibly be interested. Another is going to have to call the owner. At this time my fiancée calls back. Her friend will do it. She’ll be here in an hour. The weekend should be saved. Unless I suddenly forget how to drive a car. Hey anything’s possible. After all I did forget I had a dog.